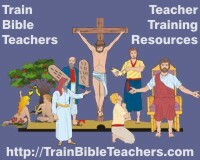 Sunday School teachers need resources. The more we can equip them with all they need from curriculum to teaching supplies, the more they will be able to focus on teaching and shepherding their students. The more time they must spend researching and collecting needed materials, the less time they will have for their students. The Shepherding Ministry Manual looks at Sunday School as a shepherding venue in which it includes the following answer about the Sunday School teacher's greatest resource. Sunday School teachers must personally rely on the Chief Shepherd and point their students to Him. The greatest resource the teacher has is God Himself. Who is better to mentor the teacher on how to shepherd students than the Chief Shepherd? Let His example guide you. He had compassion on people He encountered who were "like sheep without a shepherd" (Matt. 9:36). He laid "down His life for the sheep" (Jn. 10:11). He entered into relationship with them as reflected in His own words, "I know my sheep and my sheep know me" (Jn. 10:14). Consequently, teachers must nurture their own walk with the Lord. Live like you believe Jesus' words in John 15:5 which says, "I am the vine; you are the branches. If a man remains in me and I in him, he will bear much fruit; apart from me you can do nothing." Also remember the Apostle Paul's words in Philippians 4:13 which says "I can do everything through him who gives me strength." The greatest resource the teacher has to offer others is God Himself. Who is better to feed, lead, and guide the sheep than the One who can be with them 24/7? You, the teacher, are only with the students 45 minutes to an hour each week but with rotating schedules for teaching may not be there every week. Even if you go the extra mile and invest into their lives outside of the classroom, your time with each student still is minimal. Consequently, teachers must make sure they use what time they have with their students to point them to the Shepherd of whom David wrote when he said, "Even though I walk through the valley of the shadow of death, I will fear no evil, for you are with me" (Ps. 23:4). Teach the Bible stories and doctrinal concepts but always take students beyond to the God who cared, orchestrated, empowered, and brought the victory. If the curriculum you are using doesn't go that far, you need to take it to the next level. Remember, the Bible is not a book about Moses, Noah, Abraham, Elijah, or the Apostle Paul. The Bible is about God. Keep connecting students with God Himself so they get to the point where they are able to say in their hearts and not just in their heads, "The Lord is my shepherd, I shall not be in want" (Ps. 23:1).